The sailfish is related to other "billed" fish, such as Marlin and Swordfish, which are all very fast. But the sailfish has them all beat by clocking in at speeds up to 68mph. 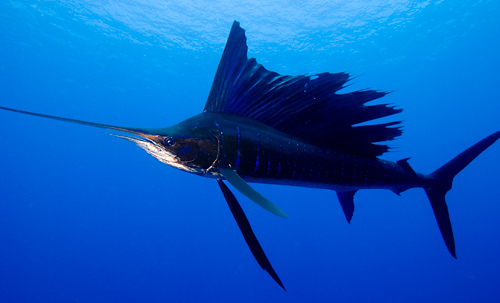 Sailfish live in both the Pacific and Atlantic Oceans in warm waters. Sailfish are a very well-known species of fish (you've probably heard of them, and maybe even seen one mounted) because of their popularity among sport fishermen. They are world-renowned for the challenge they provide even the most experienced anglers. In fact, there isn't much science knows about this species of fish, except what observations fishermen have gathered from encounters with it. Over-fishing of this magnificent fish has led to a noticeable decline in their numbers, so that many people who fish for them are putting them back after they've caught them (called "catch and release"). Even as well known as they are, sailfish are a difficult species to study because they are highly migratory and are typically found many hundreds of miles from shore. These two factors make it very difficult for scientists to locate, tag, and collect data on specimens. Cooperation from sport fishermen who prize this species is essential for scientists to learn more about the sailfishes' range and behavior. What little we do know about the sailfish is limited to its range, habitat, growth, and diet. Sailfish are found in both the Atlantic and Pacific oceans with different scientific names assigned to the fish in either ocean (Pacific - Istiophorus albicans; Atlantic - Istiophorus platypterus). However, scientists now believe that these fish are actually the same species, the only difference being the ocean in which they live and their size - the Pacific ocean sailfish tend to grow significantly larger (up to 10 feet). Based on catch rates and water temperature, it has been determined that sailfish prefer to live in warm waters (approximately 79°F), although they have been caught as far north in the Atlantic as Cape Cod. Growth: Some studies have been done to examine the growth rate of the fish with some pretty amazing findings. After a female sailfish lays her eggs they hatch 36 hours later! They are also a fast growing species, where a hatchling can grow up to six feet long in one year's time. How big do they get? The average length is 6 to 8 feet, but the world's record holder caught in 1994 weighed 141 pounds and was over ten feet long. Diet: They eat flying fish and squid, preferring tunas, mackerels, jacks and other fish that swim near the oceans surface. Divers have reported seeing several sailfish work together to corral their prey, using their high fins to create a wall that keeps the smaller fish from escaping, as well as scaring them into smaller, denser groups. They've also been observed using their long, sharp bills to stun and skewer their prey. Scientists have also photographed them hunting in groups, flashing brilliant colors on their bodies when excited by their predatory behavior during feeding. A sailfish leaping from the ocean with its large sail-like dorsal fin retracted against its body. Sailfish usually raise their sails when they are excited or swimming on the surface. When you first look at a picture of this fish there are lots of questions that come to mind; "Why the tall fin? Tell us all about that big fin! "; "Why the long beak? ", "How did it get to be so fast and why is it so fast?". If scientists can study this fish more closely, many of these questions can be answered. Most importantly, we study this fish, and all other fishes, to learn more about their contribution to their ecosystem (the ocean environment) and how they affect all other creatures, including humans. Since we put significant pressure on this particular species of fish by fishing for them for sport and for food, we need to learn as much as we can about them to protect their numbers. Once we have a better understanding of how sailfish live, how often they breed, how quickly they grow, the best conditions for them in the ocean, what they need to eat to stay healthy and robust, we can work to ensure that the numbers of sailfish we take from the oceans isn't more than the species can sustain without a decline in population.